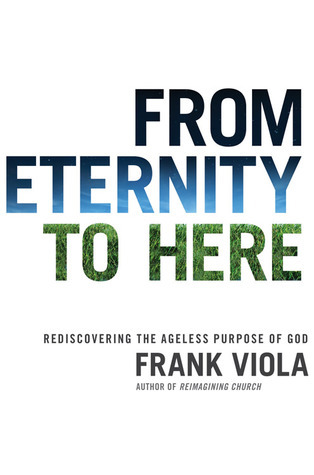 Frank Viola’s latest book, From Eternity to Here: Rediscovering the Ageless Purpose of God is not an easy one for me to shove into a loved-it or hated-it slot on the shelf of books I’ve read. I was outraged, inspired, impassioned, incredulous, and challenged by this book.From Eternity to Here tells of “the ageless purpose of God” in three parts, weaving what the author hopes is a compelling story that – as the subtitle suggests – dates from before time began.I found two problems early on – one disappointing from an intellectual perspective, one spiritually disturbing.First, I was a little disappointed to find a rehash of ideas popularized, though not originally conceived, by John Eldredge, an author whose works (Wild at Heart, Epic) have touched my life in pretty profound ways. Viola seems to borrow from Eldredge and others the idea that we are all born into the story that God is telling, though in his mind it’s a romance rather than an epic. To my relief, the book doesn’t take quite the straight line from this point that it appears to be on.However, much more disturbing is the whole premise of part one – that God’s ultimate passion is His bride. Some reading this review may find nothing wrong with that statement, but based on my reading of Scripture I have to disagree with it. God’s ultimate passion is His glory. Everything that God does or commands serves the ultimate purpose of bringing Him glory.Move on to part two, and we find that God is homeless and longs for a place to dwell. The God of the universe who is perfect and complete is homeless?By this point, I just can’t believe the ridiculous statements I’m reading, and I’m finding ludicrous even much more mundane statements. Then, I read the statement that is very nearly the final straw for me – and would have been if I hadn’t promised to review the book! Viola writes that the house God is building or has built, which he has equated at one time or another to both Christ and the church, “becomes indistinguishable from the Builder.” Add to this the statement later that “the church is Christ,” and the most serious error of this book is obvious: Viola is putting God on our level.The author has a lot of ideas here that I love. He speaks of the church not just as a group of people but – in turns – as a community, a colony, a family, a new species, even a single organism. These ideas are engaging, intelligent, and biblical. He writes, “The body of Christ exists to express God in the earth” and that “the conversion of lost souls is the means toward that end,” not a goal in itself.One of my favorite statements from this book is this: “…one of the highest revelations you and I will ever receive is to see the church as Christ in corporate human expression.” Beautiful and true! The church is not an institution or a building or an event. It is us, and we are – in a very real way – the body of Christ, His physical expression in the world.He also writes, “One of the greatest problems in the Christian faith today, I believe, is that Christians are taught to be salt and light in the world as individuals[emphasis mine:],” and, “…the great need of the hour is for Christians to begin learning how to gather together and embody Christ in a shared-life community where they live.”These statements can be mind-blowing. Viola insists that the pictures of the church as the bride and dwelling place and body of Christ are not just metaphors but concrete truths. He sees and expresses the need for all its members to hold a much higher view of the church.The problem is definitely not his high view of the church but his low view of God. The church is the body of Christ, but the church is not Christ. We are not to be equated with Him.Christ embodies us – the church – but we cannot contain His limitless nature. This may very well be the most revolutionary book I've read outside of The Bible, itself. Frank Viola has presented some radical truth in his newest book. He already had me reeling from his historical treatment of what's wrong with today's "church" in Pagan Christianity, and then gave us a great description of what "church" should look like in Reimagining Church. This book, while not quite about the same topic, takes the purpose of the Church even further. Presented in three sections, From Eternity to Here examines the true destiny that we have as believers in Christ. Using much Scripture, Viola lays out that we, the Church, are 1)the Body of Christ, 2) a House for God, and 3) a completely new species or race of people. Now, I've heard all my life that the Church is "the body of Christ," but I've never heard it presented quite so literally. It's going to take an additional reading just to fully grasp all the concepts that he presents in the book. And I do play to do that.I enjoy Frank's writing style, and recommend this book to anyone who is looking for a fresh perspective on life in Christ, and who is looking to have their beliefs shaken up a bit. To discover God's original intent for humanity, Frank Viola explores the imagery found in the only four chapters of the Bible which have not been tainted by The Fall: Genesis 1 & 2 (pre-fall) and Revelation 21 & 22 (after the effects of the fall have been erased). God's ageless purpose has always been to acquire a Bride, a House, a Family, and a Body that is by him, to him, and through him. This is a modern day masterpiece. The writing style is powerful and the message is one that we rarely hear today. I've been studying the Bible for many years and almost every page was an "aha" moment where I discovered a new insight. The book connects the dots of Scripture into a beautiful sweeping narrative. I bought the book because of the endorsements from the top missional leaders today http://www.FromEternitytoHere.org "From Eternity to Here" is a modern day classic. Viola always rattles me with a solid foundation and well built explanation.His writings have filled in the dots for many answers I have sought for in Scripture.Thank you Mr. Viola for pointing to Jesus, instead of a system of beliefs. I found this book eye opening in the way he expresses us in Christ, a concept I have always believed, but never saw such depth in. Each thought took a familiar concept, the bride, the house, the family, and made it into a flowing life in Christ. This for me had a deep affect on my life, I cannot but highly recommend this book to everyone whether you're Christian or not. It will challenge some people, but it really is scriptural. And, it's well written. At the risk of sounding hyperbolic, this is one of those books that may actually be life-changing. This book is a must read for any true believer the God of bible.I could not put it down , it lines up with scripture. I am amazed at the depth of wisdom displayed in this book.Frank Viola writes like he plays with words and above portrays Jesus Christ in a manner that a baby would fall in love with. The "big picture" on God's purpose (as if He needed one!) Excellent summation of the Bible and all its themes. Viola's Magnum Opus! I appreciated the way that Viola wrote the same story three ways. I thought it improved the understanding to have it presented for different perspectives. If you want to grow as a Christian, this book is a must read!! Wow!! already read this once last year sometime, excellent handling of what the church could really be like, given a fresh approach to how God sees His church. Very thought provoking! This book may challenge some of your previous thinking & your beliefs. Be ready to either accept what Frank.Viola is is expressing or toss them out all together.However, I am so thankful to have read this. In fact, after reading it the first time, I am now re-reading it. I hope on enjoy it as much as I did, and still do. May God Bless you as you read it. His approach to biblical theology though innovative despite his attempts leads to antinomianism. Parts were helpful but his work on the church is experimental and lacking the theological catholicity needed. I was taught that 'life began' with Adam and Eve. My 60 years of spiritual journey was based on my response to God and sin. This core belief led me down a road of 'striving to please', depression, anxiety, worry and other unhealthy ways of coping with life. This book affirms that 'life began' with God's love and overflowing passion. God is the center of Life and Love. God's love could not be contained. His love needed a home, a creation in 'his image' and a place to enter and rest. His love has no limits. My life has changed. The Love of God is now my core belief. I received this book from one of the DTS speakers in YWAM. His topic was on the true church, the ekklesia, and this book was obviously a source for his teaching.In his book, Viola takes a look at what the Bible has to say about God's plan in reaching out to mankind, both in creation and in sending Jesus. He clearly outlines three functions of the followers of Christ and takes time to expound on each idea. My main struggle with this book was a sense that I had heard it all before. I often had to pray before reading because I didn't want to carry that attitude with me as I read. I did find some sections to be especially stirring and they became starting points for prayer. The biggest challenge for me seemed to be accepting the truth of his words and wondering what his ideas would look like if active in my life. At times I also struggled with his writing style. I'm not a big fan of ending chapters with ellipses and cheesy one-liners, and I found myself fighting an eye-roll every now and then by the way Viola chooses to "hook" you to continue reading.I actually found the last chapter to be the most interesting and fulfilling. Viola shares his testimony of being a part of so many movements in the church, only to be left wanting. I feel that many followers of Christ are in this state. We're looking for the newest thing, and in the process we lose our focus on Christ. When we focus on things like power or evangelism or prophecy, it is often because we have forgotten or simply don't comprehend that Christ IS those things. He is the Word of God. He is the power of God. He is what draws men to Himself. I wish I had written this right after I finished because now I'm reading another book about the church and my thoughts are confused. Overall, I would recommend this book because it is challenging to the way Americans view church and can really stir one's heart to truth. Every now and again a book comes along that captures the essence of Christianity in a remarkable way. These are the writings that subsequent generations refer to as “classics”, and they are usually only recognized for their profundity and timelessness once the author is no longer around. There are many examples (although not too many! ): Watchman Nee’s The Normal Christian Life, Andrew Murray’s Abide in Christ, Dietrich Bonhoeffer’s The Cost of Discipleship, C.S. Lewis’ Mere Christianity, Chesterton’s Orthodoxy, Gene Edwards’ The Divine Romance, and so on.The latest addition to the “Classic” bookshelf in my library (reserved for the very best of Christian literature) was published only a few years ago. Yet it is regarded by many as one of the greatest Christian books of the last few decades, and a certain future classic.I am, of course, referring to Frank Viola’s From Eternity to Here. Although not everyone agrees with Viola’s views on the church (he co-authored the controversial Pagan Christianity in which he and fellow author George Barna takes on “institutional Churchianity”), few of his critics find fault with this book. It has been endorsed by traditionalists and radicals alike, and is revolutionalising the way multitudes of believers worldwide see the “big picture” of Christianity.Unlike so many Christian bestsellers of late, Viola has no new revelation to offer (thank goodness). On the contrary, From Eternity to Here combines in one volume the greatest and most precious insights from the best of the “Deeper Christian Life” authors of the past few centuries. People who are unfamiliar with authors like Nee and Murray, and with Christian movements such as the Brethren, will find this book astoundingly revelational and deeply edifying. I do not usually read non-fiction of any sort, especially religious non-fiction, because it is difficult to be absorbed into what I am reading. This book, on the other hand, was a true gem. 1.) Writing Style: This book read both as a sci-fi/fantasy/romance that made it easy to visualize the comparisons from scriptures many Christians may have grown up hearing so often that they often feel mechanical. You can see the examples when reading instead of being simply taught another way to interpret them. Very brilliantly put together and straight-forward. I loved the comparison of different books in the Bible to show the themes of God's purpose through the whole book, and for the first time it made sense that the Bible is one single volume about God, not separate books that are merely laws and recorded history.2.) Subject Matter: Viola reminds me of a modern-day Paul in that he has been blessed with insights into scripture that are revolutionary! The topics of this book all seem so simple, and when broken down are so easy to understand, that it makes you wonder how you ever overlooked them in the first place. Viola turns to scripture as opposed to personal experiences/personal opinions to support the truths in this book, which is encouraging as well. If you are a "floating Christian" or unsure where you stand in relation to God and Christ this book should be a must for you.I have thoroughly enjoyed reading this, and will move on to read other Viola works as well. I really wanted to like this book, and for the most part I did. However, the 2 star rating is due to some dubious extrapolations from scripture used to support Viola's chosen metaphors to express God's purpose. For example, it is totally valid to talk about the Church as a girl Christ pursues, and about God's purpose to make His bride beautiful, but it is maybe not so much to say that scripture says 90 year old Sarah was physically transformed into a young hot babe after God's promise to give her and Abraham a son. I may be being nitpicky, as this book is hardly a work of academic theology, but still, such things annoy me and make me wish Christian writers of talent would treat the scriptures with a little more care. That said, Viola is a writer of talent. He is engaging, thoughtful, creative, and concise in his expressions. He is also saying something worth saying. Viola traces God's purpose for creation and humanity through the whole story of Israel's history up to the coming of Christ and projects into the future speculating as to what God is up to, discounting none of the revelation of the future without assuming that revelation is complete or that we fully understand it. Worth the read, though with a bit of filtering for exegetic license. It is rare that I read a book I feel privileged to partake in. I have a few of my top most-recommended books that would fall into this category. I am pleased to say Frank Viola’s From Eternity to Here is now one of those books for me.This book reads much more like the story it is meant to be. It tells us of a God who loves us more than we could ever comprehend. A God whose mission and purposed passion shines with such glory, our natural response cannot help but be faithful praise.Frank Viola shares with us the purpose of The Bride of Christ, the mission God has in looking for His House & the ultimate fellowship The Body of Christ shares in as the Family of God. Frank Viola leaves the reader longing for the day when Christ returns to claim what is rightfully and gloriously His — what has forever been a part of God’s eternal plan.You and I, forever a part of God’s eternal, glorious plan.I could not recommend this book more. This is one of those, eye-opening, mind-blowing, new-perspective kind of books, dealing with all the information about God and the church that (let's face it) has become a bit stale and stodgy and completely reframing it, making it fresh and new and alive. My perspective on what a relationship with God means to both myself as an individual and as a member of the church, Christ's body, has been renewed. I found this hard to put down! Excellent book that delves into some of the ways God reveals His ultimate purpose through the Bible. Frank Viola is a deep author who writes with a passion and purpose for the Bible and Jesus. It shines through in this book. This book has been updated under the new title "From Eternity to Here." Frank likes this book more than his readers. I became tired of it. But love Frank Viola and what he stands for. This book speaks volumes about the church today. Viola provides a simple answer to the problem that shouldn't be difficult to implement yet seems to be in our busy lives.